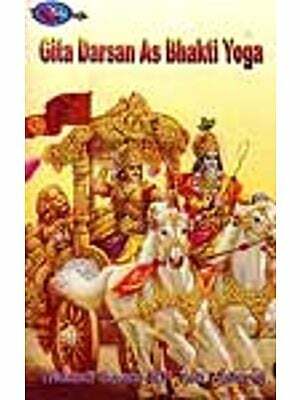 This is a comprehensive text on Bhakti Yoga (Yoga of Devotion). 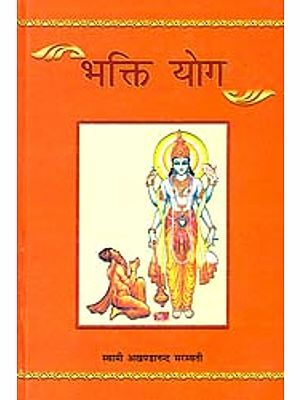 It covers all aspects of Bhakti Yoga with detailed guidelines for its practice. It is one of the four major paths for attaining the life’s goal of self realization or God realization. Compared with the other paths the practice of Bhakti yoga is far simpler less austere and more natural. Everyone may not have exceptional energy to practice Karma Yoga or keen intellect for practicing Jnana Yoga or one pointed concentration for practicing Bhakti. Therefore as the Divine Sage Narada states Bhakti is the easiest of the spiritual paths. Though all the paths of Yoga lead to the same goal, Bhakti is considered to be superior to the other paths in some respects. In all other paths, there is the fear of a fall but in Bhakti there is no such fear. The other paths are methods of practice and are needed as long as one has not realized the Supreme. They only help the aspirants on their way to the goal. But supreme devotion (Para Bhakti) is both the means and the end. Supreme Devotion and God Realization are identical. Bhakti is a living force in the spiritual life of the world. Throughout the ages many devotes have realized god by deep devotion and self-surrender. 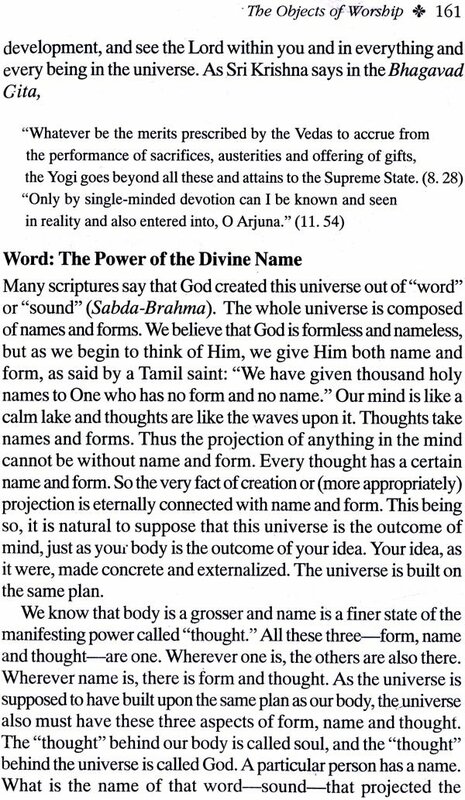 This text on Bhakti Yoga (Yoga of Devotion) was assembled from the transcribed lectures of our Rev. Sri Gurudev Sri Swami Satchidananda and from the Narada Bhakti Sutras and their commentaries the teachings of Bhagavan Sri Ramakrishna, and other Saints which are listed under References. I acknowledge my grateful indebtedness to all them. If there are any errors and fault I am personally responsible. 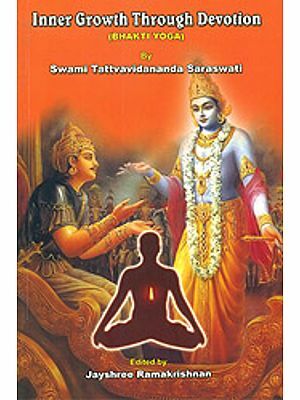 This text is a comprehensive one covering all aspects of Bhakti Yoga with detailed guidelines the great Yoga of Divine Love. There are four major paths for attaining the life’s goal of self realization, namely Bhakti Yoga, karma Yoga, Jnana Yoga and Raja Yoga karma Yoga is the approach to god through selfness service. Jnana Yoga is the path of wisdom. It is the approach through dispassion and discrimination between the real and unreal. Raja yoga is the approach through intensive practice of meditation. These three Yogas – karma Yoga Jnana Yoga and Raja Yoga – demand qualities and faculties that are not possessed by every one or even by a large majority of human being. Karma Yoga calls for exceptional energy and strong will as well as great humility and patience. Jnana Yoga requires an exceptionally acute intellect and reason. Raja Yoga calls for unwavering concentration and control of sense. Compared with them the practice of Bhakti Yoga seems far simpler, less austere and more natural. Everyone may not have exceptional energy, keen intellect or concentration, but all have love in their hearts. Therefore as the Divine Sage Narada states Bhakti is the easiest of the Yogas. The very fact that very ordinary persons have become great devotes and realized God is a valid proof for this statement. The compilation of this work entirely due to the Grace of our beloved Sri Gurudev and the Supreme Lord. Indeed Sri Gurudev and the supreme lord worked through this soul. With deep Devotion I dedicate this Text to the Lotus feet of Sri Gurudev and the Lord for having used this as an instrument in their Hands. 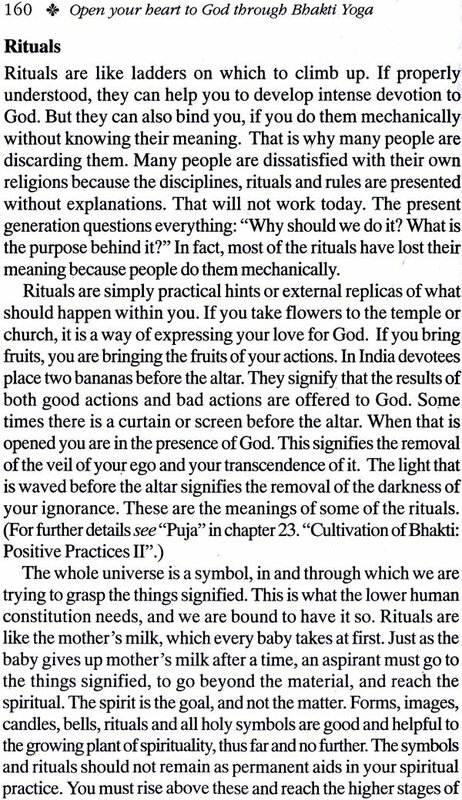 May this text inspire and guide the students of Yoga and Devotees in their sincere practices for achieving the ultimate purpose of life God realization.